Ntsanwisi was born on 11 July 1920 at the Shiluvane Mission Station in the Letaba District of Limpopo. He was the eldest child in a family of three. With only a Standard 6 certificate (but later obtaining a matric via correspondence), he entered Lemana Training Institution, a Swiss Mission Teachers’ College at Elim, Limpopo province. Ntsanwisi received a BA (1962) and MA in African studies (1965) from the University of South Africa. Overseas scholarships took him to Georgetown University in Washington DC and at Hartford Seminary, Connecticut, USA to study linguistics. Upon his return to SA he taught at Emmarentia High School, Bela – Bela. He then became the founding principal of Shiluvane Secondary and Bokgaga High schools, both in the Letaba district. After becoming the Polokwane–Lowveld and Zoutpansberg–Sibasa circuits school inspector in 1964, he lectured at the University of the North (Turfloop). There he was also Professor of African Languages and Dean, and later became Vice–President of the Transvaal African Teacher’s Union. He authored plays (e.g. Masungi, Makomba Ndlela ) and a descriptive study of idioms in Tsonga. Ntsanwisi was the first African moderator of the Tsonga Presbyterian Church, a position he held for 12 years. From 1966 to 1968 he toured extensively in Europe and the USA, presenting lectures and addressing conferences. He was awarded a Doctorate of Administration in 1985 by the University of the North. Supported by Tsonga–speaking Chiefs, Ntsanwisi entered politics in 1969. He was installed as the first Chief Minister of the ‘independent homeland’ of Gazankulu. The apartheid government wanted Black and White people to live separately, so they set certain areas apart for Black people. Thus it systematically dispossessed them of their land and controlled them via puppet leaders. ‘States’ such as Gazankulu were effectively land-locked labour pools and enjoyed no international recognition. In 1985 Ntsanwisi accepted the chieftainship of the Majeje people. 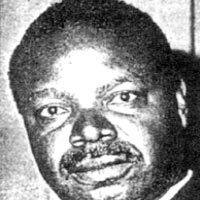 Ntsanwisi died on 23 March 1993. He was married to Beatrice with two sons and two daughters.